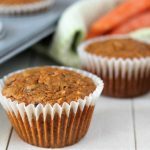 Easy gluten free vegan carrot muffins that are loaded with shredded carrots, raisins, walnuts, and spices. They’re very similar to carrot cake…but without the icing! I’ve shared a few carrot muffins with you already, carrot ginger muffins and carrot coconut muffins. 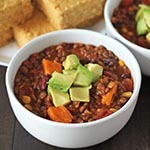 This recipe is similar to those, but they’re all different in their own ways. 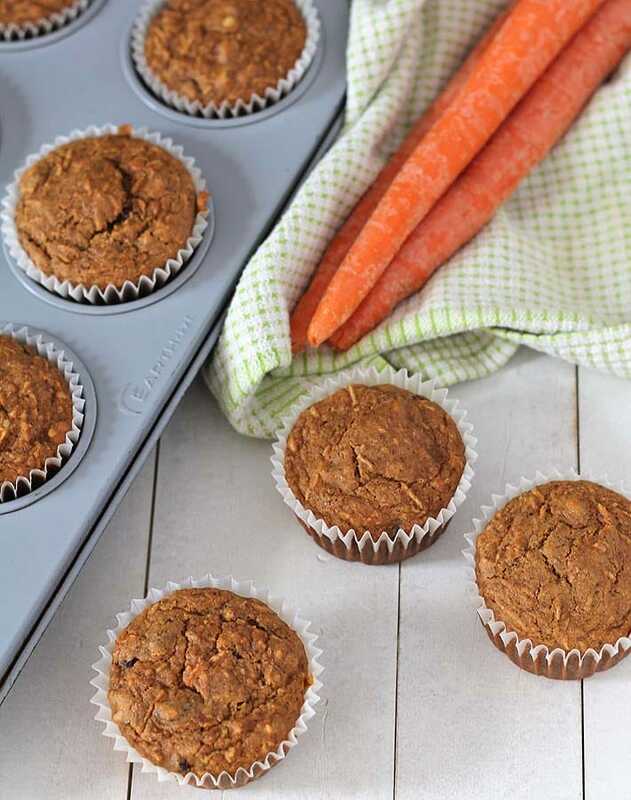 I hope you try them all at some point, but today, it’s all about these quick and easy vegan carrot muffins. 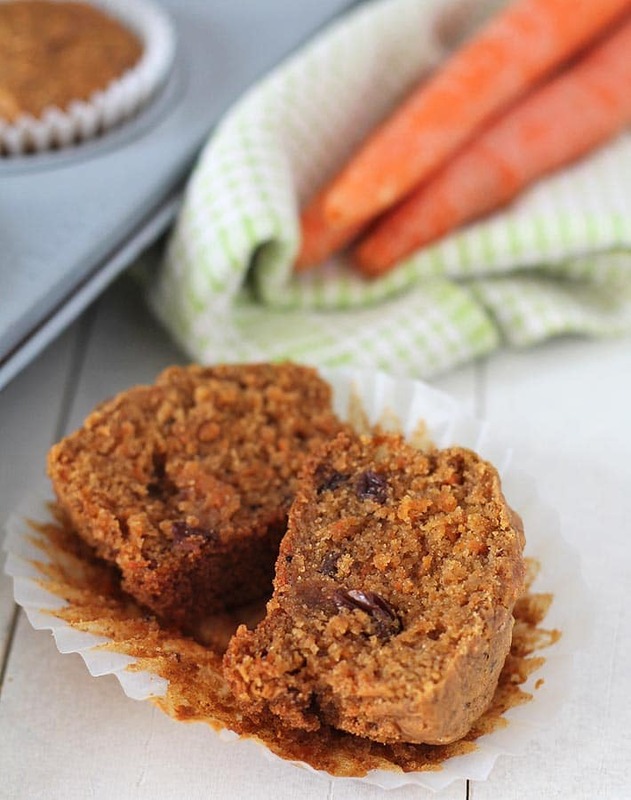 Of all my carrot muffin recipes (carrots make good muffins! ), this one reminds me most of one of my favourite cakes, carrot cake. Don’t you love carrot cake? If the answer is yes, then this vegan carrot cake muffin recipe has your name written all over it! The ingredients are simple but the part that makes them special, I think, are the spices. 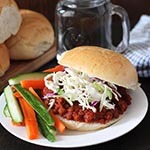 Cinnamon, nutmeg, and ginger all team up to give them great flavour and then there are the add-ins: shredded carrots, raisins, and walnuts. How big should the carrots be grated? You want to finely grate the carrots, have a look at the carrots in the image above to get an idea. Use the smaller of the two shredder sides on your box grater. Do I have to add raisins to these carrot muffins? So…raisins. I’ve spoken about them before in other recipes, I love them but I know many don’t. You can leave them out, but I don’t recommend it. When testing the recipe, I made them once without raisins and they were good, but not as good as they could have been. These muffins are not overly sweet, so the addition of raisins adds to the overall sweetness to make them just right in the sweetness department. They’re moist, fluffy and have a very nice texture, not always something you would expect from a gluten free carrot muffin but have a look at the image below to see. 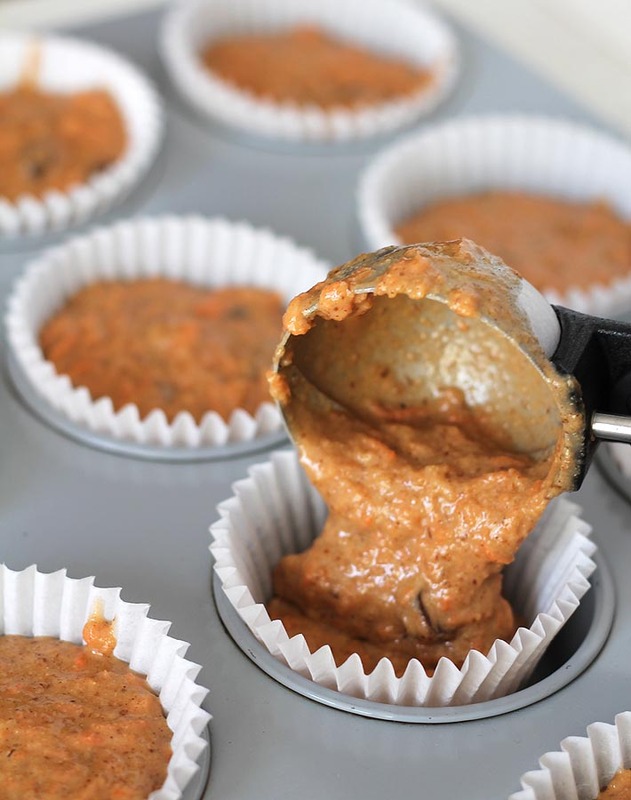 When you use gluten-free flour blends in baking, especially iin vegan gluten free muffins, your finished treats sometimes tend to toughen up the day after, but a quick warm-up will get them back to where they were right after they came out of the oven. 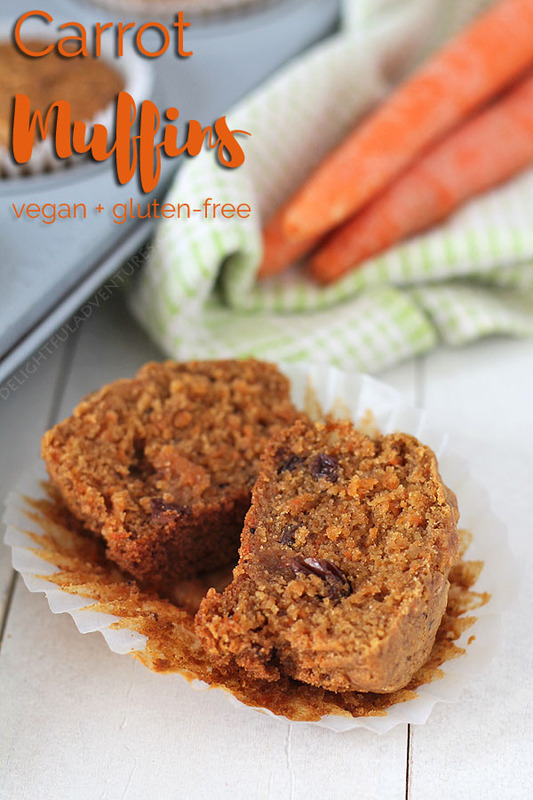 I hope you enjoy these gluten free carrot muffins as much as I do. Be sure to pin them on Pinterest and if you make them, share a pic with me by tagging me on Instagram. I’m @delightfuladventures over there and my hashtag is #delightfuladventures. I love seeing your remakes! 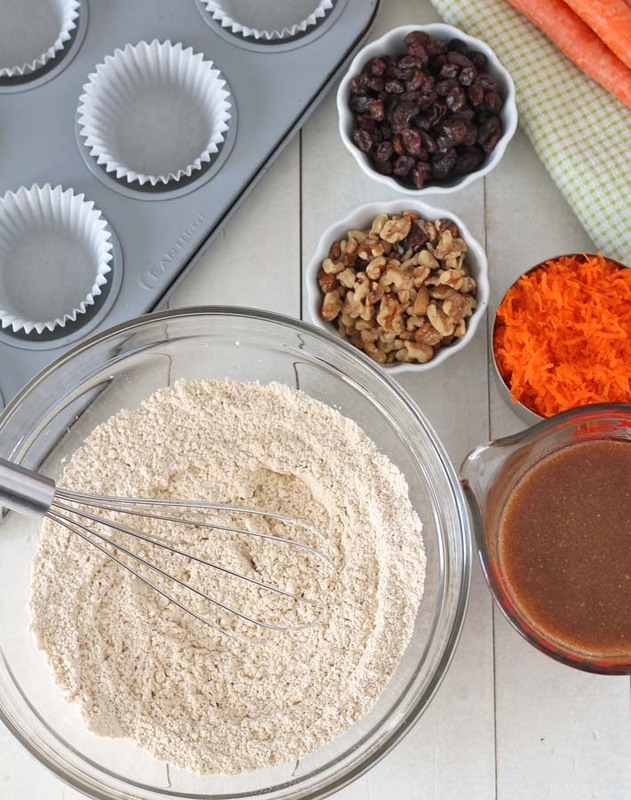 Easy gluten free vegan carrot muffins that are loaded with shredded carrots, raisins, walnuts, and spices. They're very similar to carrot cake but without the icing! In a medium bowl, whisk together the flour, baking powder, baking soda, salt, ground cinnamon, ground nutmeg, and ground ginger. In a large bowl, mix the flax mixture, coconut oil, vanilla, applesauce, and non-dairy milk together. Stir in coconut sugar until blended. Fold in the carrots, raisins, and walnuts until well incorporated. Divide batter using a large scoop or spoon into the 12 muffin cups. Nutrition info listed below is for 1 of 12 muffins. This info to only be used as a rough guide. Click here for more info on how nutrition info on this website is determined. I hope it works with your flour, Marijke! You can buy the flour I recommend on Amazon (I link to it above) if Amazon is a possibility for you. I haven’t tried it with other flours, so I can’t say how it would work, but best of luck! Hi Gwen…. 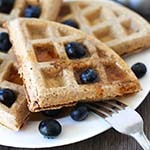 could I use regular all purpose flour instead of gluten free and if so same amount?